At the start of 2013, Percolate Co-founder Noah Brier spoke to the company about its values and how it’d keep its culture intact through fast growth. By June, the startup had doubled its headcount to 60 people. When Brier referenced the presentation mid-year, he realized that half of the people in the room hadn’t heard it. From then on, he knew he had to plan as much for his future employees as he did for his current team. That meant thoughtfully designed onboarding. With Percolate, Brier has built a marketing platform used by over 400 clients, including global brands such as Unilever, GE and MasterCard. Over nearly five years, the company has brought on more than 300 people across six offices. Brier’s creative chops from Fast Company and BusinessWeek have helped him build this team — and are arguably most evident in Percolate’s carefully crafted employee onboarding process. At First Round’s CEO Summit, Brier outlined the four principles that Percolate abides by when onboarding new employees. To show how they manifest in practice, he explains the company’s entire onboarding process in detail, from the moment employees sign their offer letters to when they finish their first week. For fast-growing startups that stress the importance of talent, here’s a blueprint to help integrate and motivate your newest employees. 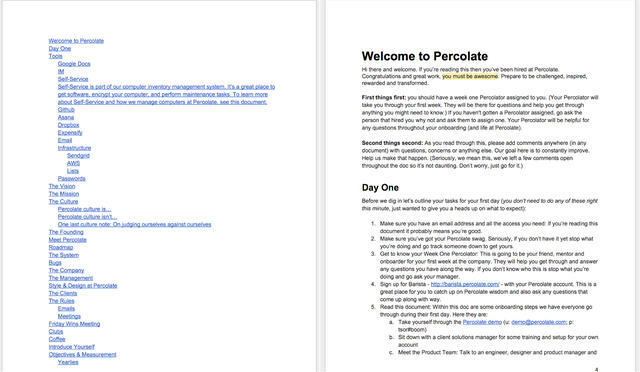 Before jumping into the day-by-day onboarding plan at Percolate, it’s worth covering the key tenets that guide it. These ideas are embedded in how and why the company rolls out its onboarding process the way it does. Write it all down. For six months in 2013, half the people at Percolate had not heard Brier speak about its values and lay out the year’s kick-off plan. He fixed this by designing a thorough onboarding program that’d get new people acquainted with the company and its culture as quickly as possible. Key here was writing everything down. Nothing scales better or faster than words. The average adult reads two to three times as fast as she listens. Plus, documentation is a ready resource, while people aren’t always available. Distribute decision-making. For Brier, culture is how you make decisions, and the first exhibit of your culture is onboarding. “It shows your shared set of values and how they help people make decisions that are in the best interests of the company,” says Brier. “You can't scale a company without trusting people to make decisions without you. If you're going to do that, you need to provide a framework for making decisions, because not just any decision will do. You want them to make good ones.” The new hire is introduced to our values through the entire onboarding process. From the Day 1 Document to the office tour to department specific meetings the new hire learns just how our values inform decision making. If marketing is the outward manifestation of your brand, then culture is its internal embodiment. That begins with onboarding. At Percolate, the best way to internally articulate its culture, guided by good design and crafted by everyone, is a structured onboarding plan. Here, Brier lays out the process his company uses for new hires, from the moment they agree to join to the end of their first week. The company is constantly refining its process, but this has been its plan over the last few years. Most notably, each new hire receives a Kindle. “That's linked to a core idea that we are a learning organization. It's our responsibility to help encourage people to continue to read and make themselves better,” says Brier. “They can read whatever they want but personally I find the Kindle to be a pretty amazing device for continuing to find new ideas in the world. Default to filling new hires’ calendars. Don’t leave them with the feeling that you’re surprised that they showed up. An employee’s workspace is an opportunity to reinforce its strong design aesthetic and place in a broader community. In addition to items in Percolate’s orange hue, the company uses the products and services from fellow First Round Capital-backed startups, such as Poppin which provides stylish office products and furnishings. Introductions. 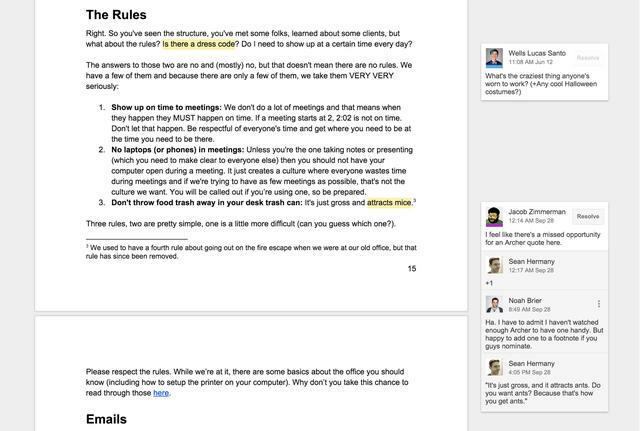 Every Monday morning, Percolate has meetings for both the business and product teams. These weekly kick-offs are an opportunity to do a quick introduction of new hires. It’s meant to be fast, not comprehensive, so that faces can start to become familiar. Introduce Yourself Email. As outlined in the Day One Document, a hire sends an “Introduce Yourself” email at the end of the first day. It’s a scripted greeting to the company from the new hire sharing a bit of background and trivia. “Everyone who starts with the company sends one out. 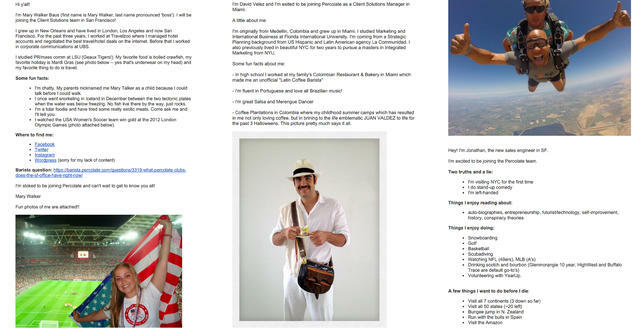 It also includes a photo and a link to three questions on Barista, Percolate’s internal Q&A platform. The idea is that it’s not about just giving information, but starting an exchange with your new team,” says Brier. People Operations. As this is the first group to interact with the new hire, this team typically provides an overview of its role, the facilities and general office culture. In a separate meeting, the team walks through benefits packages and enrollment. IT. IT answers initial setup questions for all hardware and software given to the employee. They outline and offer support for any future technical problems. Sales. Percolate’s sales team shares how it’s structured to most effectively make deals. Design. The design team explains how it implements Percolate's brand via its mission: to create the best suite of products for marketers through a start-to-finish design process that inspires a collaboration. Given Percolate’s strong design culture, the group deconstructs each part of its mission. “One of those is ‘start-to-finish.’ We ask our designers to do everything from research all the way up to visual design,” says Brier. Marketing. As a startup building marketing software, this meeting covers not only how Percolate brands itself, but also how and why it serves marketers. 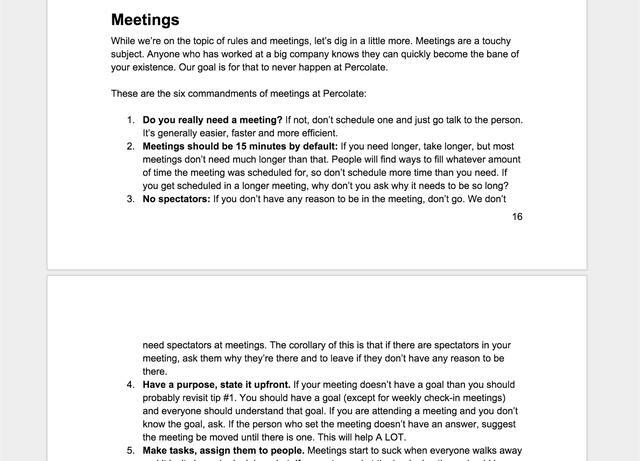 In addition to meetings aimed at educating new hires about each team, Percolate schedules sessions to integrate new team members by jumpstarting relationships. Regardless of how casual they may seem, the company schedules them so as not to leave them to chance. Coffee Break. Between the meetings with each department, new hires are trained to use Percolate’s espresso machine. “If you name your company after a coffee product then it's a requirement that you have good coffee products around. People tend to not necessarily know how to use it,” says Brier. Percolator lunch. During the first week, Percolators take new hires to the office’s favorite neighborhood restaurants to enjoy lunch and casually learn more about Percolate’s culture. As the last of the big onboarding meetings, Brier takes the newest members of Percolate through the history, philosophy and culture of the company. He shares how the organization thinks about product-market fit and how that connects to its vision to build the system of record for marketing. Brier explains why the company documents everything and the new hires’ role in adding to that story. As you grow the company it’s important to remember that your time with people doesn’t scale. Focus on founder connectedness. When Brier delivered his message about onboarding at the CEO Summit, he had just finished a quarter in which Percolate hired over 75 people — nearly a person a day. The company grew its headcount by 30%. So before onboarding, a significant contingent was unfamiliar with the company, let alone anything achieved the quarter before. That’s exactly why Percolate has developed an onboarding program to help immediately instill its history, culture and values in its new workforce. From an intriguing "Introduce Yourself" email to a well-designed new desk to the "Day One" document, Brier has made sure his new hires’ first impressions are impactful ones.